Like many artists I’m a “craft in public” person. I hate to waste downtime traveling or waiting for appointments that could be spent getting a few more strands put together. This means that I have been caught red handed doing Kumihimo on the bus, in doctors offices and at the mall waiting for friends. What comes of this and why is it important? Most people will stare at you likely wonder what on earth you are doing. Some are just fascinated to watch your hands deftly move those strands of yarn around to make the bracelet that is appearing at the bottom of your disc. 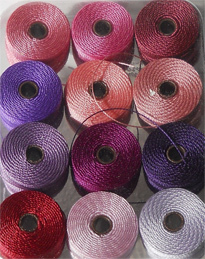 Occasionally a brave person will come over and ask “What are you doing?” The answer of course is “Kumihimo”. At which point you will get a blank stare and a “what?” from them. 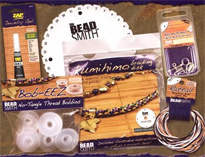 How to explain what Kumihimo is? I then proceed to show them how it weaves back and forth in the simple right down, left up configuration (8 strands) and excite them over how easy it is to do! That’s my favourite part of Kumihimo it’s a relatively inexpensive craft (in comparison to say scrap-booking) that is easily accessible to many different ages and skill levels. Everyone can take a piece of yarn and put it in a new place, and with the numbering of the disc it makes it even easier! What I don’t tell them is that it’s incredibly addictive and can get elaborate as you add in new materials (ie: beads, eyelash yarn etc.) and move on from 8 strands to 4, 16, flat, etc. That’s for them to discover in the world of Kumihimo if they pursue it further. So what’s the key to getting people to remember this cool craft? They need to be able to remember what it’s called! And let’s face it the word “Kumihimo” is cumbersome on a good day. 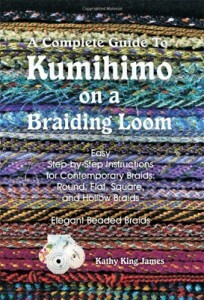 I usually tell them to google Japanese braiding or give them a business card to my Etsy Store so that they can at least get the spelling of Kumihimo and see what can be possible if they so choose to pursue the hobby. One thing I often remind myself is that we aren’t just creating items because we love them and want to share them with the world. We are also the unofficial spokespeople for the art. Without those public times when you bravely bring out your art on the bus, in a doctors office, at city hall, in line to vote etc. the world may never see or hear of this amazing art. And wouldn’t that just be tragic? Take pride in your craft and share it with the world! That is what art/craft is about, after all, personal enjoyment and sharing the technique with the world. Mel is the proprietor and creator of Epic Stitching & Handmade Design. She learned to Kumihimo in 2010 at a stitching retreat and has not looked back since. You can find her wares at her Etsy Store: Epic Stitching & Handmade Design.